Tinkerbell is one of the most iconic characters from Disney's line-up. Although she has a minor role, her mischievousness and cheerful attitude captured the hearts of everyone. In fact, most girls wished to be Tinkerbell at one point in time. For the holidays, why not welcome her and let her sit on top of the Christmas tree? Her pixie dust and beauty will surely brighten the mood of the room. Keep in mind that there are plenty of Tinkerbell tree topper varieties. The plethora of choices can easily confuse any shopper. To help you make the task of choosing more enjoyable, this article compiles five of the best Tinkerbell tree toppers available for purchase online. This Tinkerbell tree topper is one-of-a-kind. Specifically, the piece is designed by Jim Shore. Jim Shore is already considered by many as a legendary artist in the giftware industry. He is known for is an unmistakable style that primarily combines a unique color palette with a European and American folk-art style. Apart from being designed by a famous artist, this Tinkerbell is painted and crafted by hand. Each piece is unique in a slight way. It's an excellent choice if you want a tree topper with a distinct personality and not something that's being mass produced in a factory. The piece features Tinkerbell sitting on Poinsettia with the iconic red leaves on top and green leaves on the bottom. She's also holding her magic wand, spreading love and happiness all around. Attached on the bottom of the item is a gold-colored cone-shaped coil. With the coil, you can just twist Tinkerbell into place. The item is about six inches by 6 inches by 8 inches. Also, it weighs around one pound. If you want a Tinkerbell tree topper that can light-up the mood and the room, then this may be the perfect one for you. In this item, Tinkerbell is portrayed as swirling towards the top of a Christmas tree. As it's the holidays, she is wearing her red dress rather than her usual green one. The highlight of the item is it can light up. Tinkerbell's wings and flight path around the Christmas tree will emanate a soft and mesmerizing glow when switched on. Another thing to point out is the Christmas tree is adorned with tiny Mickey Mouse logos. The product is fully sculpted and features a bit of a retro style. The Christmas tree is also crafted from a felt cone, making it classy and luxurious. The item is battery powered, and that means you don't have to deal with the hassles of wires and electric outlets. It's also safer as batteries are not as a fire hazard compared to electrically powered decors. You'll need three AA batteries to light-up Tinkerbell's wings and flight path. Tinkerbell is known for her "glittering" personality. So why not bring that glitter on top of your Christmas tree. 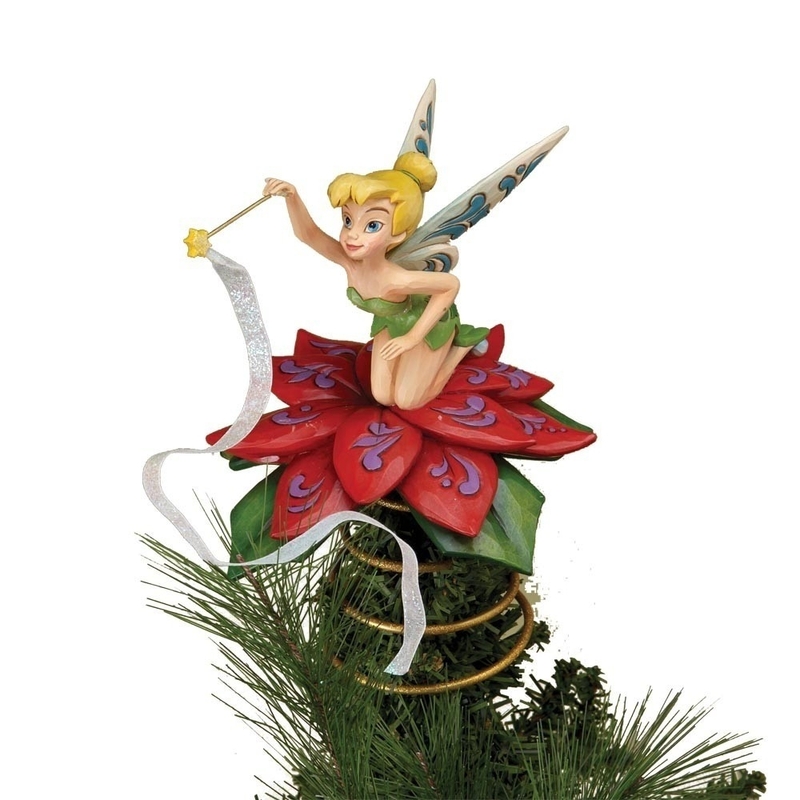 This Tinkerbell tree topper is a product of a handcrafted design. The item is then meticulously hand-painted to bring out Tinkerbell to life with all of her fiery spirit and cheerfulness. Tinkerbell's gown is specially designed for the holiday season. The ruffles are made to look like holly leaves with a general shape of a Christmas tree. Tinkerbell also loves anything that shines, and that's why simulated gleaming jewels are painted on some of the holly leaves. Of course, Tinkerbell wouldn't be as famous without her pixie dust, and that's why her dress comes with a glittery finish. Another highlight of the product is the genuine Swarovski crystals that are embedded on a star that sits on Tinkerbell's hair. Her wings are also as beautiful as it's glisteningly elegant. This Tinkerbell is a limited edition so you might want to get her now while she's still available. If you want a Tinkerbell tree topper that can truly illuminate the room, then this one is an excellent choice. First of all, the item comes with a huge star that's able to glow brightly. Of course, there's the highlight of the product, and that's Tinkerbell. Tinkerbell sits on the star with a charming pose with a big smile to greet anyone who gives her the attention. In this item, Tinkerbell is crafted with fine details. Also, her dress and wings could steal the show with all the glitters that come with it. A metal frame cone supports Tinkerbell and the star. With the cone's design, you can easily perch the item on top of your Christmas tree. The metal frame is also durable compared to other attaching mechanism. The item is powered by batteries, and you'll need three AAA to light it up. Batteries are not only more convenient but are also a lot safer. The batteries are stored in a separate box, and it's connected to the star through a wire. This setup ensures that the topper won't become too heavy that it will easily fall. Watch Tinkerbell as she zips through the Inkwell trail with this beautifully presented decor. The setup primarily features Tinkerbell on one of her iconic poses. She is fully sculpted in this piece and specially designed to bring out the holiday spirits of everyone. Her translucent and glittery wings are eye-catching and elegantly beautiful. To protect Tinkerbell on her journey, she's encased in a glass dome. The item sits on a faux wood base and comes with a flat base. Thus, it can comfortably work as a shelf decoration. If you think Tinkerbell deserves to be on the Christmas tree, the item also comes with a satin ribbon for easy hanging. Tinkerbell's style comes from the artist sketchbook designs, which is directly inspired by Walt Disney's 1953 film entitled Peter Pan. The item is crafted from a combination of glass and resin. It stands at the height of four and one-fourth inches and comes with a diameter of three and one-fourth inches.